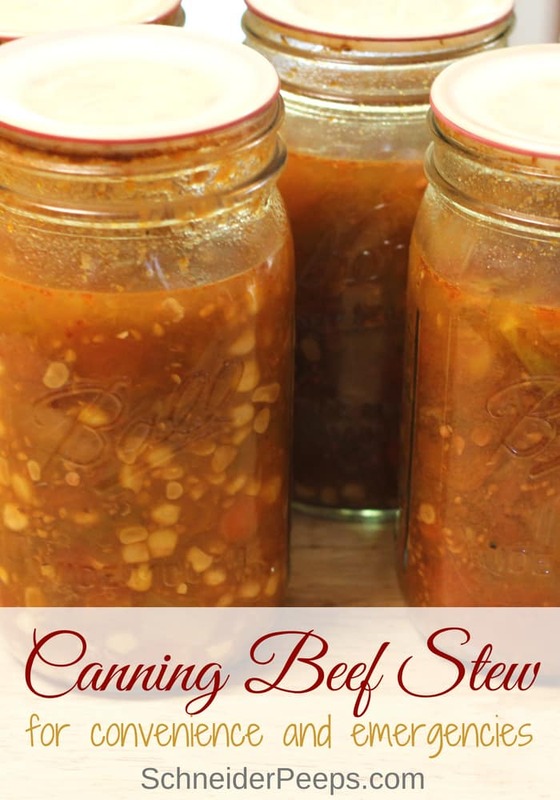 Every summer I find myself spending a few days making canned beef stew, I make other canned soups and stews also but canned beef stew is our favorite. 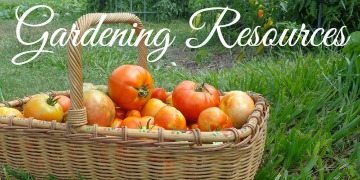 Even though it’s hot, I like canning beef stew during the summer because I can use the produce right out of our garden. 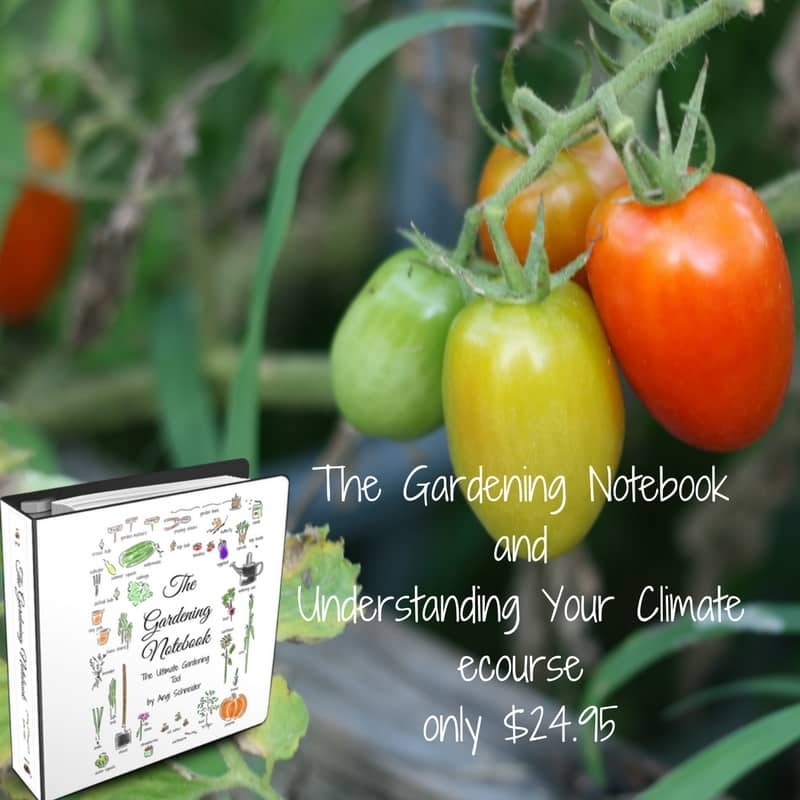 I use these worksheets to plan and keep track of my home preserved food. You can get the worksheets emailed to you by filling out the form below. In order to can stew safely, you need a pressure canner. I KNOW there are people who say they just boil it for 4 hours and they are still alive. But this is one area that I’m going to go ahead and trust that the USDA has our best interest in mind and is telling the truth. You can do what you want, but for our family the risk is just too great. This is the pressure canner I have and I love it. I can put 7 quarts or 19 pints in it. If I start early in the morning I can get three batches canned in one day. 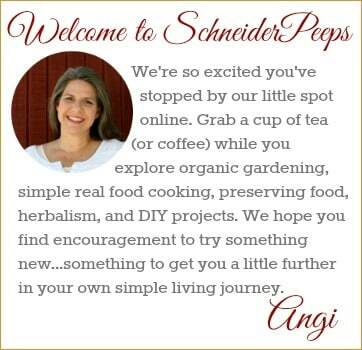 So, I usually use my large restaurant quality stock pot or my roaster oven to make the stew. If I start later I’ll make a smaller batch and use my large cast iron skillet for the pot. I use the hot pack method but I don’t actually precook the beef stew. 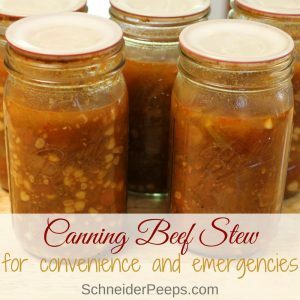 I’ve never had the stew turn mushy while canning which some people like to raw pack canned stew. The first thing I who when I can anything is put my tea kettle (which holds almost a gallon of water) on to boil. I also prepare the jars and lids. 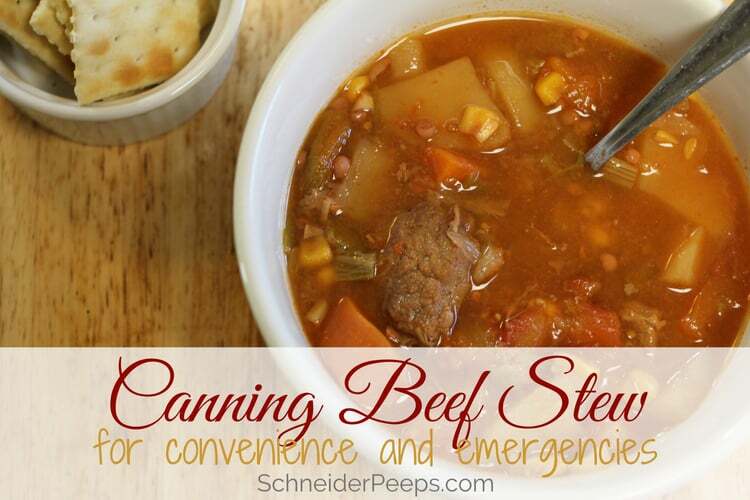 Since the canned beef stew will be processed for more than 10 minutes, the jars and lids don’t need to be sanitized, just wash them in hot soapy water and rinse them. If’ I’ve planned well, I would have set out some frozen tomatoes to thaw the night before. If not, I pull out some tomatoes from the freezer and thaw them in the microwave. I always freeze our tomato harvest first so the skins will come off without blanching. We like a lot of tomatoes in our beef stew so I use about two gallon size bags of frozen tomatoes. I put a little oil in the stock pot and sear about 6 pounds of beef – I’ve used stew meat, roast, and even a trimmed brisket, whatever is the best price is what I use. 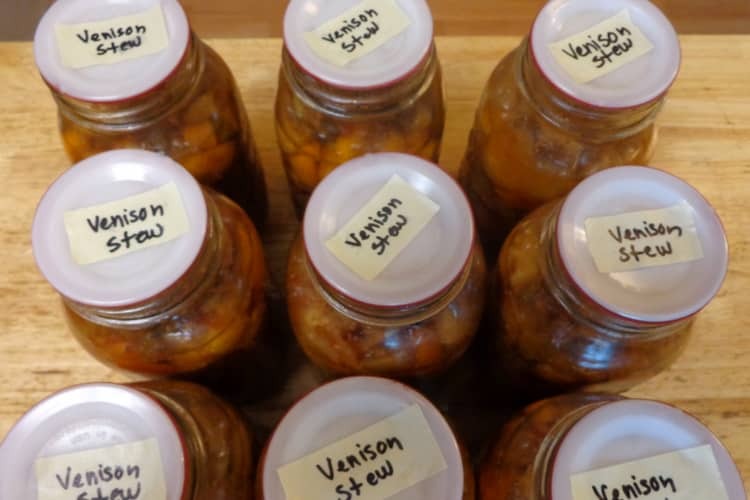 (I’ve also made canned venison stew using the same process.) I don’t cook it all the way, just lightly brown it. When the meat is done, I take it off the heat and add 2 heaping tablespoon of salt, 2 teaspoons of thyme, about 2 teaspoons of black pepper, and 3-4 bay leaves. I know some people like to use beef bullion in their beef stew but we really like the fresh flavor of a tomato based beef stew. But if your family likes a more beefy beef stew, then feel free to use bullion. Then I put the tomatoes and other vegetables in the pot. I usually put 3 heads of garlic that has been peeled and chopped, 4-5 chopped onions, 3-4 lbs chopped carrots, 8-10 pounds diced potatoes, 6-8 cups of corn, and 2-3 pounds of okra. I really love adding okra to our canned stews because mucilage in the okra adds a bit of thickening to the stew in a safe way. I mix up all the ingredients and add some water or tomato broth (or chicken broth) to it if the liquid doesn’t cover the meat and vegetables. I keep the heat under the pot or on the roaster oven on the lowest setting to keep the stew warm. The canning part is really easy, you just have to take your time and enjoy the process. If you didn’t do it earlier, wash each jar and lid in warm soapy water. Put the pressure canner on the stove and add water according to the manufacturer directions. Fill each jar with the beef stew mixture and leave a 1″ head space. Wipe the rims of the jars with a clean damp cloth. Top jars with lids and bands. I really like to use canning reusable lids on these because I don’t normally give these as gifts. Place hot jars into water in pressure canner (prepared per manufacturer guidelines). Once the canner is completely depressureized, remove lid. Once they’re cool, remove bands, wipe jars, and store properly. Having home canned stews is so convenient for during the school year, I really have no excuse for not having from scratch meals each evening. If time is really short, I can serve the stew with fruit and crackers. If I have a bit more time I can make biscuits, and if I’ve planned ahead I can make homemade bread. But it’s not just for convenience, it’s also for emergencies. We’ve had storms come through that has knocked our power out for a few days. We’re totally fine because we have a variety of canned stews available. 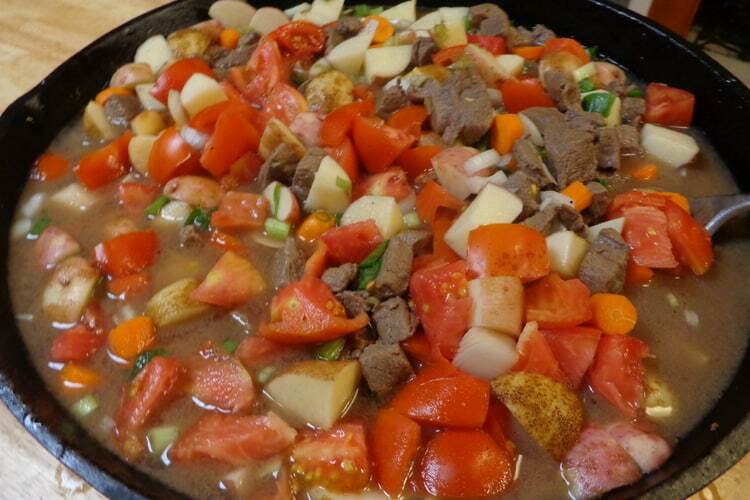 This is a tomato based beef stew that makes for a wonderful canned stew. You can pretty much use whatever vegetables you like in beef stew to suit your family's taste preferences. Put a little oil in the stock pot and sear the meat. Don't cook it all the way, just lightly brown it. When the meat is done, take it off the heat and add spices. Add the vegetables to the pot. Mix up all the ingredients and add some water or tomato broth to it if the liquid doesn't cover the meat and vegetables. Keep the heat under the pot or on the roaster oven on the lowest setting to keep the stew warm. If you didn't do it earlier, wash each jar and lid in warm soapy water. Fill each jar with the beef stew mixture and leave a 1" head space. Top jars with lids and bands. I really like to use canning reusable lids on these because I don't normally give these as gifts. Once they're cool, remove bands, wipe jars, and store properly. What kind of meals in jars do you can? It makes approximately 18-20 quarts. I make it in quarts and pints. Quarts for my family for dinners and pints for my collage age children to take to school and my husband for backup lunches to take to work (for when we don’t have enough leftovers for his lunch the next day). Hope this helps! Thanks. I may cut it down in size since there isn’t as many to feed at my house. It sounds delicious. Why can’t you flour the meat and brown it before canning it? I like stew that has a bit of thickening to it! Tell me why you made the comment about avoiding starch and flour when canning? Thank you! Hi Steve, flour or other thickening agents can keep the heat from penetrating all the soup during the canning process. https://extension.psu.edu/preserving-soup-safely. You can easily add a bit of flour, cornstarch, or arrow root to our stew when you serve it as you need to heat it up anyway. Adding okra to mix when you can it also adds some thickening to the soup in a way that is still safe to can.